If you’ve followed me on Twitter or read my blog for any length of time, you’ll know that I’m pretty rigid in my schedule. Ever since I was a child I have done everything adhering to strict deadlines and I started using calendars perhaps in my very early years. A lot of people think I have a very regimented schedule (this is the previous post where I shared mine), but this term, I built a lot more flexibility, particularly because I do want to do some fieldwork still. As you can see, I can’t write for 2 hours every day (because I need to exercise, have breakfast and shower and drive to campus), but I still can definitely squeeze 10 hours per week of writing. I NEED to protect my research and writing time even during teaching semesters (I only teach one semester per year). You will notice two things: First, that I still have 10 hours worth of writing time, but I have distributed them unevenly. I still wake up at 4:30am, and I still exercise, and spend time out with my friends. But all the white gaps you see? Those are for the things that I need to do at some point, including fieldwork. So if I need to go on the field on Friday, I’ll prepare my lecture on the Tuesday. And second, that I have not scheduled EVERY SINGLE MINUTE of my day. I have left ample time for contingencies. I still protect my time, particularly writing and class preparation, and self-care, but the rest of the time? I leave room for contingencies and potential fieldwork. I teach 2 courses this fall, plus a lot of continuing education diploma sessions, so it will be intense, but I also believe it will be rewarding. If I need to change something, it probably will be writing in the very early morning because I still want to make it to the gym before I go to campus. I also put class preparation on the Friday so that I can clear my docket before the weekend. But if I need to do fieldwork, I’ll move it earlier in the week. 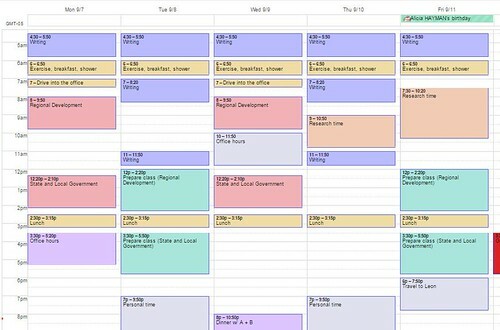 Tagged with academia, organization, schedule.